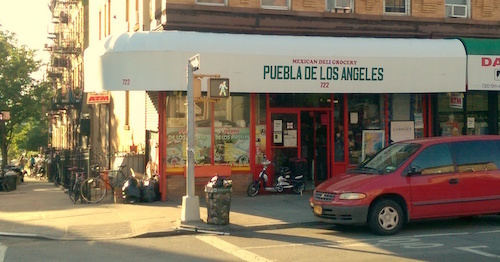 The southern Mexican states of Guerrero and Puebla are neighbors, and in this space on 5th Avenue, the former has passed the baton of ownership to the latter. Inside, not much of the decor or energy has changed, it remains a sleepy bodega with a sometimes busy kitchen and a couple tables in the back for the few people who don't take their food to go. 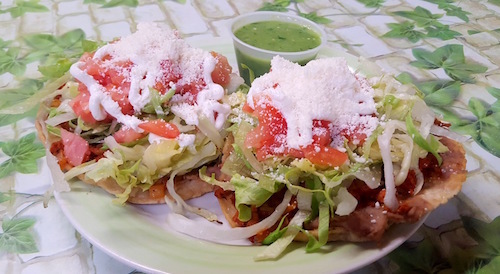 The menu of the new kitchen is just as long as the old one, comprising much of typical Mexican dishes, but there are a few specialties worth looking out for now. 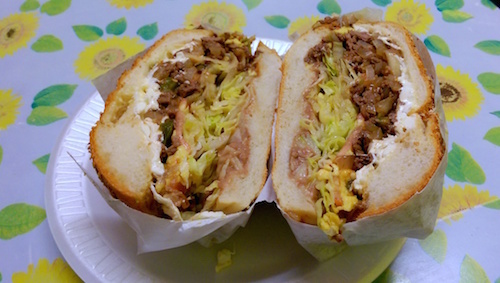 The sandwich of the house, called the cemita Puebla de los Angeles ($6.75, below) is stuffed with grilled steak, onions, and jalapeños. Their cemitas are all served with a nice layer of beans, lettuce, and cheese, and can include chipotle if desired. 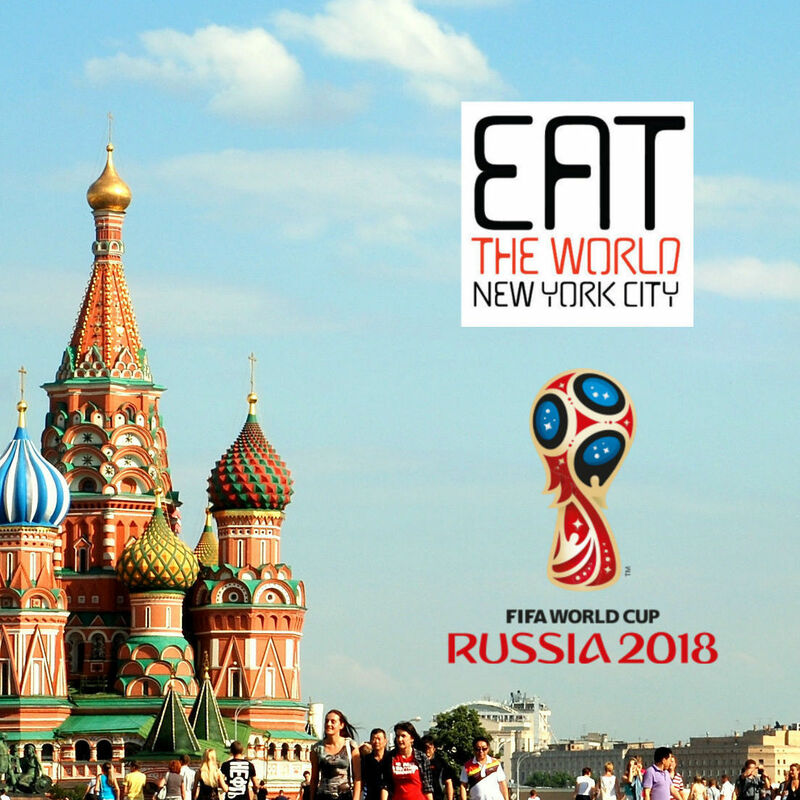 More interesting, and not on a majority of Mexican menus in New York City is the fat taco placero, of which the one with a stuffed poblano pepper (when in Puebla...) is the most appealing. 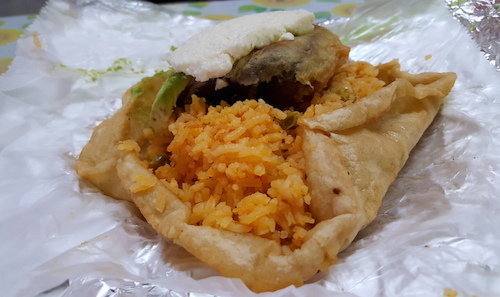 The chile relleno taco placero ($6, below) is almost a work of art, even if mine was basically reheated on a very slow day. The large pepper sits under a slice of white cheese and is stuffed with more cheese. It all sits on a bed of rice and well-seasoned potatoes and is far from wrapped with its oversized homemade tortilla. Good luck picking this guy up without making a mess. One drawback of the space still is the inability to purchase and consume beer while eating, but the fridge cases are full of Jarritos and other soda. As I popped the cap off one, the man in charge of stock smiled at me and later returned to ask if I could handle the spiciness of the taco. I assured him it was just to my liking.